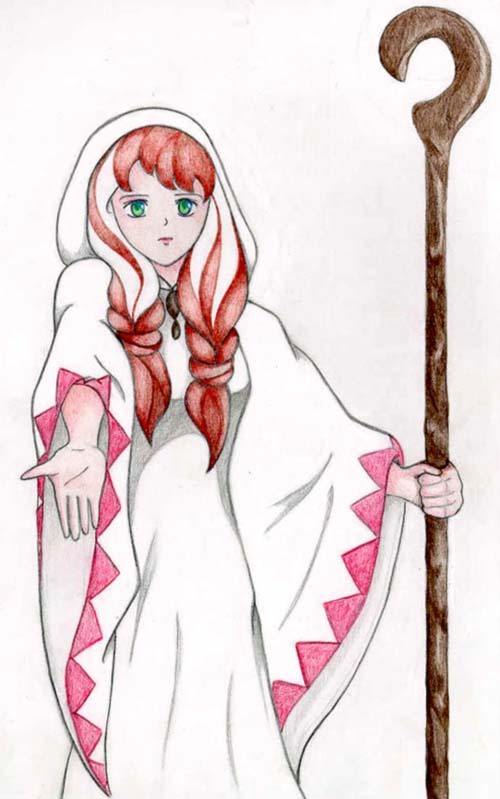 Pure of Heart and Spirit, a white mage or priest may suit your more passive fighting technique. When things get hairy, you are the one everyone depends on to heal, protect, and revive. Every party needs a defensive side, and this character is all about defence. Cure 2 180JP- Restores HP. Cure 3 400JP- Restores HP. Cure 4 700JP- Restores HP. Raise 2 500JP- Revives dead, full HP. Re-Raise 800JP- Gives Re-Raise status. Regen 300JP- Gives Regen status. Protect 70JP- Gives Protect status. Protect 2 500JP- Gives Protect status. Shell 70JP- Gives Shell status. Shell 2 500JP- Gives Shell status. Wall 380JP- Gives Protect and Shell. Esuna 280JP- Cures most status ailments. Regenerator 400JP- Get Regen when attacked. Magic Defend UP 400JP- Lowers magic damage received. Check out the rest of Amber's Gallery "The Way In" by clicking the Mage!